Pisillo featured on ABC 7 Eyewitness News! This is a new concept of "Fast Food", we only use fresh and high quality Italian products. The bread we use comes from on of the finest bakeries in Bensonhurst, Brooklyn, which has been in business for 30 years. It is delivered to us every morning, right out of the oven, still warm, and with its fresh fragrance. We only use high quality Italian cold cuts and all the ingredients and condiments are imported directly from Italy, like our bufala mozzarella delivered fresh every week. We do not make hot paninis and we do not use a press, because by using only fresh bread and the best products we want to preserve the quality of the Italian cold cuts being served so that we may offer our customers the very best tasting paninis. With over thirty selections, we offer the perfect sandwich for everyone! Our panini are filled to the brim with ingredients that are sure to leave you satisfied! Imported straight from Italy, our ingredients are of the highest quality. “This is hands down the best sandwich I have EVER had in FiDi! Quality ingredients between quality bread.” - Joe B. "I haven't tried them all but so far every one down to the last bite was simply astonishing. Run, don't walk there" - Angelo R.
It is very hard to come across an authentic Italian panini in New York. Sure, you can go to a deli and get an assortment of your favorite cold cuts. But, it's not a true Italian panini. This is what separates Pisillo from everyone else. You get a true panini sandwich with authentic Italian cold cuts where you cannot find at your typical deli. From the oppressata to our world famous mozzarella di buffalo, our mouth watering choices will leave you in love. Meat lover? Vegetarian? Dairy enthusiast? Pisillo has something for everyone. From sweet to spicy selections, the combinations are limitless. 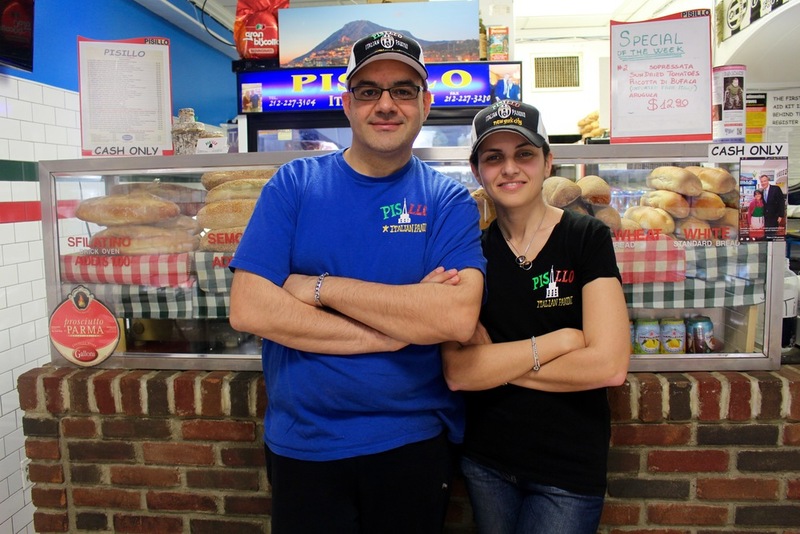 Critically acclaimed, Pisillo has been raved about for offering massive-szied panini sandwiches and giving customers bang for their hard earned bucks. In the heart of the Financial District, Pisillo is the perfect lunch spot for the hard-working New Yorker. We are proud to serve you here at Pisillo and want to thank you all for your support. Food is our passion and it is our privilege to bring the foods that we grew up with to the land of opportunity. This is your sandwich shop and we want to make it the very best it can possibly be. Buon appetito!
" ... WE ONLY USE THE BEST ITALIAN COLD CUTS FOR OUR BREADS ... "
" ... AGGIUNGIAMO AL PANE I MIGLIORI SALUMI D'ITALIA ... "